Refer a friend to the Air Force Reserve Get 1 Now program and you could become the proud owner of two tickets to see Katy Perry in Los Angeles on Nov. 22. 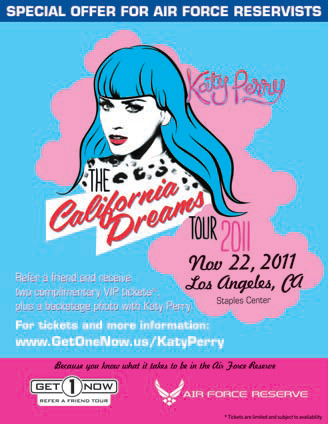 Those who win the tickets will get to see the pop star, who famously sang of kissing a girl and liking it, in what will be the last performance on her The California Dreams 2011 tour. Not only will you get tickets, but also VIP status, backstage privileges and a photo with Perry. The Get One Now Program apparently is an awards program that gives reservists and incentive to recruit. All Air Force reservist get an account, according to the website www.get1now.us . When you recommend people and those referrals turn into accessions, you become eligible for an award like the tickets to the Perry concert. If you miss out on the tickets, you could still win all kinds of things including an iPod Nano or a 32-inch flat screen television, depending on how many recruits you get. And if you’re not a big Katy Perry fan, there are still tickets available for reservist who want to see one third of the Jonas Brothers perform on Sept. 22. That’s right. You could be in Los Angeles to check out Joe Jonas. Don’t know which of the Disney brothers he is? Ask your kids and they’ll tell you he was the one with coolest hair.